Father and Son Reading. Youwall. 2013. Web. 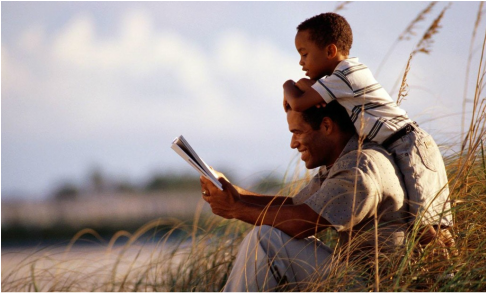 Are you interested in quizzing yourself about different issues that may be related to your experiences as a father? If so, the list below assembles various quizzes located on the internet as well as one created for this website that will help you educate yourself on a range of topics. Some are more directly relevant to health and fitness issues than others. As most dads will attest, fathering can be a challenging experience. Fatherhood.com encourages men to consider the simple but important question: are you ready to become a dad? This quiz is designed for those about to experience the wonder of having a child, especially for the first time. This quiz takes it to the next level after Fatherhood.com's quiz - the baby is already born and it's time to consider how to raise a newborn and the special challenges that can arise. The quiz discusses many common questions new fathers may have, like the regularity of burping a child or when to respond to its crying. This quiz has a more general approach. Instead of targeting specific ways to be a father it focuses on how the modern dad compares to dads of times past. For those learning what it's like to be a father, this quiz provides a nice comparison to one's own experiences with older father figures from their past. This page asks dads questions specific to living in the 21st century - questions that their dads probably never had to consider answering. From smartphones to the internet, change occurs at an increasing rate in the modern home, making it more important than ever to stay current and know how to respond to new technologies. This quiz discusses the history of the LGBT movement, as well as allowing people to assess their knowledge on the trials and tribulations LGBT individuals have faced in the past and continue to face in the present. It provides a perspective especially valuable to those looking to learn more about what it's like living as a LGBT individual. This quiz includes a series of questions pertaining to transgender individuals and the health concerns they may face during their lives. Each time a question is answered, the full explanation is provided, often including additional information that can help parents learn more about their transgender or gender-fluid youth. This quiz allows fathers looking to engage more with the health matrix an opportunity to quiz themselves about aspects of a healthy and balanced diet. Being aware of one's dietary health is a critical to being a healthier father and building a healthier family. Time Magazine - What Food Should You Eat? This quiz is somewhat more straightforward, testing knowledge of which food pairings specifically have what nutritional relationship, and can help find fantastic alternatives to questionable diet choices and allow individuals to learn more about common food traps, like foods that seem healthy but indeed are far less nutritious than they seem. This quiz, handmade for this site, focuses on concussion health and safety. Being aware of the dangers of concussions and other brain injuries may encourage better prevention strategies and limit serious complications from arising if an accident does occur. This quiz tests parents' knowledge of drug facts and statistics. It provides parents with insights about raising a child in a world with perpetually changing drug opportunities and risks.